You are welcome, Gentleman Tim! I do love this movie for many reasons, chief among them the locales … The restaurants by water with El Morro in the background are sadly no more! Back in ANOTHER day, there was an EQUALLY prolific poster, and one of his particular focuses was REVIEWS. excellent on both your parts! WOW, Ralph is one magnificent writer and reviewer!! So informative, insightful, and fun!!! Muy muy bien, Raphael! Y muchas gracias, Senor Karlo! 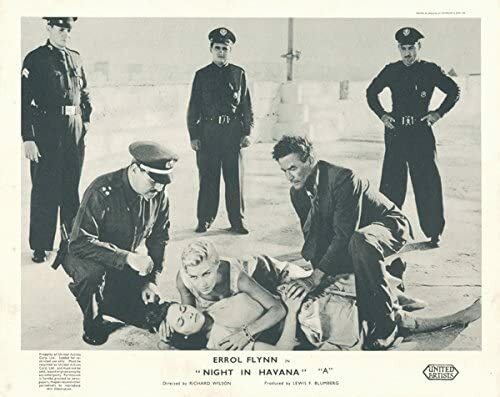 “Poor Errol” with all those “gooda lookin’ women”. Here’s a very interesting scene, with some very scrappy script. We have some odd facial expressions from Errol during this scene, and I cannot put my finger on why. I do not know what he is reacting to, exactly. They are presenting themselves to whoever might see them together but I cannot understand some of his reactions … the rest of the film is fine, no quirks, like this! Did NOT mean to distract… just thought I could give a small assist to yours and David’s efforts… please get back to the matter at hand… your TED talk!!! A Big Boston Cheers to you, King Karl! It has been shown many times on US television over the years, usually late at night or on TCM. You can sometimes buy a copy from eBay or other vintage film sites around the internet.